Written Witnessing Change by Bridger Cunningham. March 8 marked this season's 32nd original sitcom entry as NBC debuted Champions in its softening Must-See-TV Thursday block. Previous newbies AP Bio and CBS' Living Biblically are performing poorly compared to their fall counterparts, tumbling fast. Five more sitcoms have yet to debut in the upcoming weeks -- new pilot Splitting Up Together and Roseanne's 10th season premiere (March 27), Alex, Inc. (March 28) and New Girl's 7th and final season (April 10). As Trial & Error is not slated to begin filming until March 19, it can debut no earlier than April 12 or later. Who will be the champion in that pack? All bets are on heavyweight Roseanne, so stay tuned. FOX wisely took Sunday, March 4 off as ABC aired the Oscars. Their Sunday flock will wait till March 18 to unleash mayhem, as ABC's American Idol debuts on March 11. Monday, March 5 saw few changes as Kevin Can Wait (1.1) and Man With a Plan (1.0) held steady, Superior Donuts (0.9) rebounded a soft tenth, and Living Biblically (0.7) already matched the sitcom low for CBS in its second episode. Tuesday, March 6 found a scarcity of original sitcoms as ABC ducked out, leaving LA>Vegas (0.7) and The Mick (0.6) steady at their series lows. 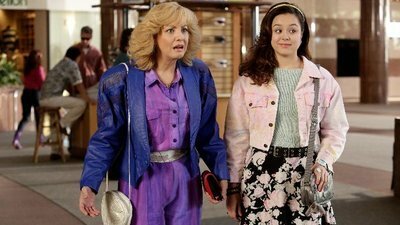 ABC improved its performance on Wednesday, March 7 as The Goldbergs (1.5) spiked two tenths, officially overtaking Modern Family. Speechless (1.2), Modern Family (1.4) and American Housewife (1.1) all bounced back one tenth. Thursday March 8 also experienced some shifts in dynamics on NBC. Superstore (1.0) bounced back a tenth as AP Bio (0.7) held steady with last week. Will and Grace (1.0) not only carved out a new series low after losing a tenth, but tied Superstore for the week. Could W&G drop below Superstore soon? And Champions (0.7) marked the lowest debut for any NBC sitcom. Over at CBS, The Big Bang Theory (2.6) and Life in Pieces (1.2) gained a tenth as Young Sheldon (2.1) and Mom (1.5) held sturdy and steady. So what is going on with the networks? It seems to be a "Hell Freezes Over" week as not only did The Goldbergs shatter Modern Family's 440-week reign as the highest ABC Sitcom (details here), but former Nielsen heavyweight Will & Grace was tied by Superstore and stands in threat of fractional territory. Both renewed series are indeed declining. All which needs to happen next is Young Sheldon overtaking TBBT on CBS or Bob's Burgers overperforming The Simpsons on FOX. Neither seems likely this season, but rather foreshadow aging and changes. These changes may signal scheduling changes next season, especially with so many rumored exits by Spring 2019. With The Middle done this May and MF declining, ABC may choose to move its prominent fixtures to make headway and attract growth. TBBT is likely done as well at CBS and will likely hand the torch over to spinoff YS. Where CBS may choose to develop, however, is moving Mom to failing Mondays and allow YS to develop a Thursday replacement. FOX's sitcoms may be trimmed as less shelf space is available due to successful dramas and acquiring Thursday Night Football for fall's entirety. That may axe the Tuesday comedy space. And NBC will likely shuffle fixtures and keep to the truncated episode orders. This season's patterns are on par with the 2016-17 season with a Silent Spring. CBS continues to tarnish newbies in their undesirable Monday 9:30 timeslot, FOX shuffles Tuesday live-action pieces and NBC debuts a multitude of low-rated pilots squashed between the hits. The only change is ABC is going for broke and debuting three new sitcoms during the last week of March and abbreviating Speechless and Fresh Off The Boat. This is a bold strategy which will likely resolve with at least two series earning renewals. Regardless of outcome, ABC has some major restructuring in need as Wednesdays are soft and Tuesdays are mediocre. Speechess -- 2016 was stellar for the series, but not so much in 2017. After disappointing outings, the series dropped as low as 55% (On the Bubble, Leans Renewal). One week ago, the series was upgraded to 70% (Leans Renewal). And after making an impressive bounceback in harsh spring territory, the series received another upgrade to 80% (Likely Renewal). Superior Donuts -- CBS' afterthought series is not rising in the ranks due to stellar performances, but rather the weakness of others. Marked at 45% (On the Bubble, Leans Cancel) for most of the season, it was upgraded last week to 55%. And after Living Blasphemously lowered the bar further, SD has been upgraded to 70% due to a lack of options.